FILE - People watch a television news screen showing pictures of U.S. President Donald Trump and North Korean leader Kim Jong Un at a railway station in Seoul, Nov. 29, 2017. U.S. President Donald Trump says he is open to talks with North Korea “at the appropriate time”. In telephone conversation with South Korean President Moon Jae-in Wednesday, Trump “expressed his openness to holding talks between the United States and North Korea at the appropriate time under the right circumstances,” according to a readout of the call issued by the White House. “The two leaders underscored the importance of continuing the maximum pressure campaign against North Korea,” the statement said. President Moon’s office first reported the conversation, which came a day after North and South Korea held their first talks in more than two years. The South Korean readout said Trump had agreed that there would be no military action while any talks were in progress. Trump expressed hope for a positive outcome. “Who knows where it leads? Hopefully it will lead to success for the world. Not just for our country but for the world,” he said. South Korean President Moon Jae-in answers reporters' question during his New Year news conference at the Presidential Blue House in Seoul, South Korea, Jan. 10, 2018. At a news conference in Seoul earlier Wednesday, Moon credited Trump with helping facilitate the inter-Korean talks by increasing pressure through sanctions on the North Korean leadership. But the South Korean leader said his approach, which entails reducing tensions through dialogue and engagement, differs from Trump’s emphasis on pressuring the Kim Jong Un government with sanctions and the threat of military force. South Korea, Moon said, wants to pursue denuclearization without risking a devastating war with North Korea that would put at risk millions of Koreans on both sides of the border. “How can we de-escalate these issues and prevent a possible armed conflict, and while doing so bring North Korea to a dialogue? 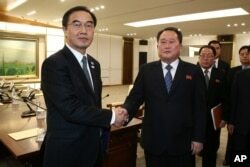 That is our current dilemma, and that requires a prudent approach,” Moon said. 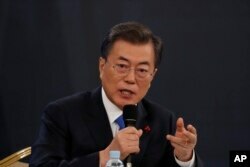 Moon described agreements reached during Tuesday's inter-Korean talks as a positive first step that could create a pause in provocations and give momentum to diplomacy. After high-level delegations met for 11 hours, the two delegations agreed to restore an emergency communication hotline between their countries, and to hold military talks to resolve disputes and avert accidental conflict at a time when tensions are high over North Korea's efforts to develop nuclear missiles capable of hitting the United States. FILE - South Korean Unification Minister Cho Myoung-gyon, left, shakes hands with the head of North Korean delegation Ri Son Gwon after their meeting at the Panmunjom in the Demilitarized Zone in Paju, South Korea, Jan. 9, 2018. The White House also confirmed Wednesday that Vice President Mike Pence would lead a high-level U.S. delegation attending the Winter Olympics next month in South Korea. At his news conference, Moon credited Trump with helping facilitate the inter-Korean talks by increasing pressure through sanctions on the North Korean leadership. But the South Korean leader said his approach, which entails reducing tensions through dialogue and engagement, differs from Trump's emphasis on pressuring the Kim Jong Un government with sanctions and the threat of military force. "How can we de-escalate these issues and prevent a possible armed conflict, and while doing so bring North Korea to a dialogue? That is our current dilemma, and that requires a prudent approach," Moon said. While the South Korean leader said his outreach to the North would not violate U.N. sanctions, critics say his engagement approach could reduce international pressure on the Kim government and weaken the U.S.-South Korean military alliance. Trump had earlier been critical of the prospect of negotiating with a North Korean leadership that has broken past agreements to end its nuclear program in exchange for economic assistance and security guarantees. But this week, Trump called the inter-Korean talks "a good thing" that had come as a result of his "firm, strong" stance. Brian Padden in Seoul and Steve Herman at the White House contributed to this report.